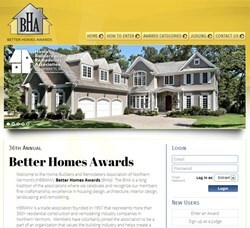 mRELEVANCE, LLC announces the launch of the new Better Homes Awards website for the Home Builders and Remodelers Association (HBRA) of Northern Vermont, http://www.bhavt.com. The goal of the new Better Homes Awards website is to streamline the awards process into an easy-to-use online format that eliminates paper and wasted time. mRELEVANCE, LLC announces the launch of the new Better Homes Awards website for the Home Builders and Remodelers Association (HBRA) of Northern Vermont, http://www.bhavt.com. The new website will help HBRA Northern Vermont organize its entire awards competition including entries and payments, judging, showcasing entries and promoting winners to the public. Mitch Levinson, managing partner with mRELEVANCE says, “How many industry awards competitions have you entered where you had to print the application, fill it out and mail it in? Or, are you an industry expert that has had to sort through dozens of pieces of paper while judging an awards entry? The goal of the new Better Homes Awards website is to streamline the awards process into an easy-to-use online format that eliminates paper and wasted time." The online awards platform allows association members to submit their projects completely online, and save or update entry information anytime during the submission period. Judges can login to the “judges only” section to review and score assigned projects online at their leisure. All complete entries along with their images and descriptions will be displayed publicly on the site, and users can choose to view the entries for the various award categories. This public display feature facilitates one of the coolest new offerings for HBRA of Northern Vermont, the People's Choice Award. This separate category allows the public to vote on the project they think is the Best Overall Project. When submitting their entries, members can upgrade their entry to be included in this category. Voting for the People’s Choice Award will take place during a two-week period in September. Those interested in participating can vote once each day during this time, and the winner will be announced at the Better Homes Awards event. This site’s simple navigation system has the ability to create an account for both members and judges, and information on how to enter, the award categories and judging. mRELEVANCE also created an instructional video to assist association members in the entry process. The Better Homes Awards celebrate its 36th year as the official awards program of the HBRA of Northern Vermont in 2013. The more than 20 award categories recognize the fine craftsmanship and excellence in housing design, architecture, interior design, landscaping and remodeling of the association's members. About Marketing RELEVANCE: mRELEVANCE, LLC creates relevant marketing and communications that reach audiences with focused and strategic messages. Through technology and creative content, messages are delivered to target markets to encourage customer action and interaction. With offices in Atlanta and Chicago, mRELEVANCE can connect your company with buyers and build relevant relationships nationwide. For more information, visit http://www.MarketingRELEVANCE.com, Like us on Facebook at http://www.Facebook.com/mRELEVANCE, Follow us on Twitter at @mRELEVANCE or call 770-383-3360 or 847-259-7312.